20th March 2006: 200 years old and he doesn’t look a day over 54. 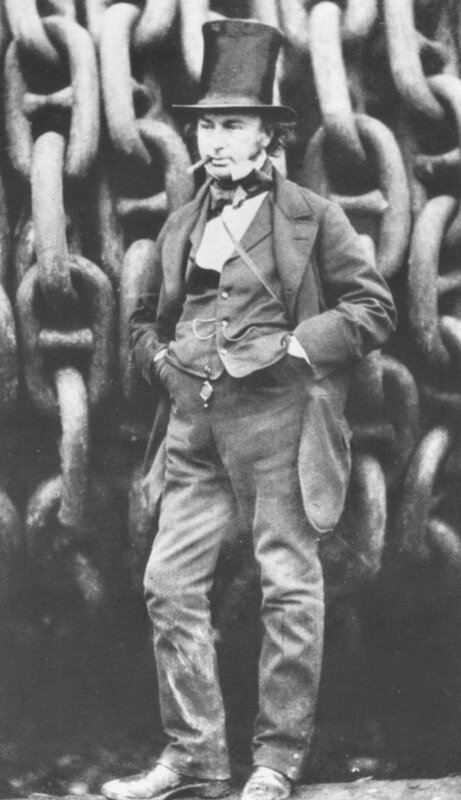 Isambard Kingdom Brunel was a walking talking giant embodiment of risk and reward. Even Brunel’s middle name was enormous, and, judging by the daring of his projects, I believe that to be also true of another couple of bits of his anatomy. The man has always been my engineering hero. Although I never met him, I think of him with great affection because he got things right and he got things wrong, but never, ever gave up. It is because of people like Brunel, and his friendly but ultra-competitive rivalry with Robert Stephenson, that the world moves forward. Because of him, we try to do the same. To put his life into context, imagine sitting in a little office in London (as he did in Duke Street) and from there looking across the whole world to find projects: for the first tunnel under a major river; for a cross-country railway line to design, build and operate down to the last rivet; for some of the best, highest and longest bridges to design and construct; for a life-saving prefab hospital in a in a war zone; for a completely new set of king sized rail locomotives; not to mention the largest ships ever seen on the oceans, driven by completely new propulsion systems. People would say we were mad if we tried that, yet that is just a tiny fraction of what Brunel actually did. As befits an engineer, Isambard Brunel was an especially good-looking man. In fact, as the saying goes, Brunel actually was an oil painting (photos from 1859 show him modestly hung on the wall of his Duke Street office for all his visitors to admire). Surrounded by his wooden chests full of amazing project drawings, with the gaslight flickering over an early photograph of his Saltash bridge, I can easily imagine him sucking on the 1850 equivalent of a chocolate digestive as he pondered a suitable fate for the rats who ate the leather seals of his atmospheric railway in the West Country. And I can imagine him riding down to Bristol on his own Great West Railway scribbling away at every last detail for the iron ship the Great Eastern, along the “broad gauge” route he had personally surveyed years earlier on horseback and down which we still hammer at 125mph today. If he lived today, I’m sure the modern Brunel would take on the difficult things: provision of worldwide freshwater, hydrogen powered transport, the cost-effective use of wind power, probably knocking off the Bosphorus Bridge and manned flight to Mars into the bargain (having designed Apollo 11 at the age of 23). We might take comfort that at least today’s Brunel could be a woman, probably even designing, making and distributing her own range of cosmetics….Brunel…. (it even sounds like a perfume). Brunel knew the power of good marketing. And in terms of changing the world, I like him because, amazingly, he did it all with only 36 directly employed people. As it happens that is about the same size as our office as I write this. I must have a word in their ears.